Found 8658 Keyboard Ipad Products. Fintie, a quality product within your reach! 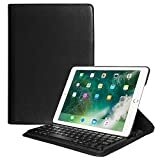 This Fintie multiple angles case comes with a wireless bluetooth keyboard that seamlessly connects with the iPad for a quicker and more comfortable typing. It converts into a stand that rotates between portrait and landscape and offers durable protection for your device. Use the Bluetooth keyboard to surf the web, watch movies, and get work done. All features of the iPad are accessible even with the case on. 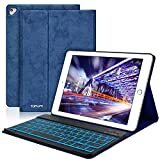 The compact structure of the case offers convenient mobility so you can just grab your iPad and be ready to go knowing it will be protected at all times! 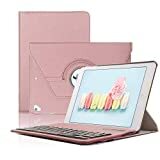 This case is designed for Apple New iPad 9.7 inch 2018 2017 / iPad Air 2 / iPad Air; Will not be compatible with the original iPad,iPad 2,3,4,iPad Pro 9.7" or iPad mini. 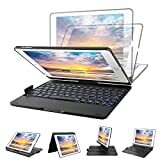 Package Contents: 1 x Multiple Angles Case(Tablet is NOT included!) 1 x Bluetooth Keyboard 1 x USB charging cable Available in a variety of bright and fun colors. 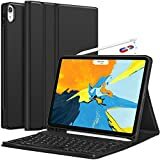 SENGBIRCH 360 Degree Rotating Case/ Detachable Keyboard /PU Leather Stand, iPad Protective Cover for iPad 9.7 (5th, 6th), iPad air1/2, iPad Pro 9.7 Feature: 1.Detachable keyboard by magnet adsorption; 2.Elastic straps hold the entire keyboard case; 3.Horizontal, vertical rotation, multiple angles. Pairing the Wireless keyboard to your Tablet: 1.Turn on the open button at the bottom right. Press the connect button on the keyboard, then the blue light can be flash; 2.Open your Tablet, select Settings, open your connect signal, keep the connect name showing on search state. 3.Then your Tablet will search for all nearby compatible devices. In the list of available devices, select the one that says " keyboard 3.0" and a pass - code will appear on your Tablet screen. Then enter the pass - code and press the "Enter" key. 4.After that, your Tablet will connect the Wireless keyboard successfully. 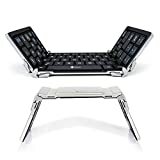 Product Specifications: Operating Distance to 10 meters Standby times : 100 days Charging times : within 5 hours Troubleshooting: If your Tablet doesn't connect the Wireless keyboard successfully, please make sure: 1.The Wireless connect function on the Tablet is enable. 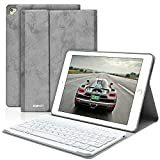 2.The Wireless keyboard is within 10 meters of the Tablet 3.The pass-code has entered correctly 4.Restart your Tablet 5.Make sure the keyboard has been charged Package Included: 1 * PU Leather rotating case (iPad not included) 1 * Wireless connect keyboard 1 * Micro USB 2.0 cable(ONLY for charging the keyboard, NOT for iPad) 1 * User manual Thanks for your selection for this wireless connect keyboard case, this ultra slim keyboard is manufactured with high quality materials to compliment your Table. This is a ideal accessory for your Tablet in the present age of portable devices. The ZAGG Rugged Book wireless Bluetooth keyboard features tough polycarbonate and soft silicone that deliver unmatched protection. Engineered with a hidden stainless steel sheet for added protection, the Rugged Book is designed to deflect impact damage away from your iPad Air and keep it looking as new as the day you got it, no matter where your adventures take you. 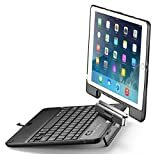 A unique, magnetic hinge secures your iPad at virtually any angle and converts into four multifunction modes while a lithium polymer battery provides up to two years of typing between charges.